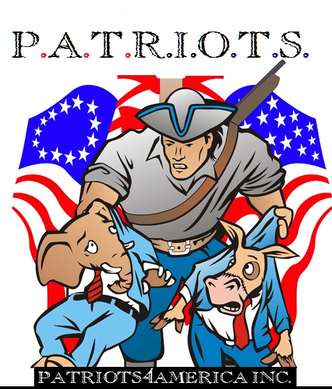 Patriots4America are here to ask, no. PLEAD for your help America in an effort to raise the funds needed to help us cover the logistical cost of presenting our message at the steps of our great Republic! It is my contention that, How can we look our children and future generations in the eyes without shame if our generation stands idle and allows the Constitution of the United States to be made irrelevant and our Nation and her history to be misrepresented & relegated to a couple of paragraphs in someones history book as the greatest nation on earth that once was! Therefore the time has arisen in the United States of America for the People of this great nation to Stand and be heard. For far too long we have been pandered to, lied to and ignored by those We The People Elect, And have (until now) entrusted as temporary stewards of OUR Republic! Well, No More! This is a Call to Action to ALL American citizens who understand, and are tired of the “Politicians” in Washington D.C. making policy, enacting laws, and forcing the American People to accept Laws and Legislation that affect our lives and our livelihoods without the slightest concern or consideration as to whether or not the American Electorate agree with these policies, laws, or legislation. If Congress or the President of the United States regardless of party are going to impose any Law or Legislation that in any way impacts the entirety of the American People, it should without question be put to Referendum by the American People. Whereas: Congress and the President of the United States of America shall be subjected to any and all legislation imposed upon the American People, be it Social, Fiscal or Ideological! can gather at the footsteps of the Grand Halls of our Republic, an ocean of Patriotic Americans to at least double that of the 2009 Tea Party march on Washington D.C. in order to Demand once and for ALL a Redress of Grievances as that right is Granted us in our Declaration Of Independence! We can do this America, all we have to do is Start this arduous but achievable Journey! It isn’t going to work like this. Second: You are starting way way too soon. Third: It degrades your efforts to start off as a blogger with a campaign site. 1- This post isn’t for me, this is for a friend of mine who is doing an event in Washington DC. 2- My campaign site is separate from this, but I post campaign updates here as well since the press won’t. 3- I have to start off early. I am going up against an entrenched incumbent. Also, when you are running in a campaign, there is no such thing as too early. Many campaigns lay down groundwork years ahead of time. My research indicates that with presidential races they can start up to three years before the person officially declares candidacy. As per the campaign manager and fundraiser, I do not have anyone at my disposal unless I pay for it, and since I am not independently wealthy or even making a large sum annually, I am left to do it on my own for now. I get the lovely job of going solo until people either step up to volunteer or I make enough to pay someone. But since my message is not “main stream,” and clearly not conventional, the media won’t really cover what I am doing (hence the grassroots efforts of those willing to help me out). I am also likely disregarded as a non issue since I am not registered with a political party, especially not an R or D.
I have known some who were in the same position as you…no money to campaign. They started knocking on doors and introducing themselves…asking the folks they met what they wanted to see in a person running for office. They did this at least three times before the election at every household they could! The first two times let them talk…write down their comments! The third time….you get to tell them what your platform is about and ask them for their support! Ah, this was actually for a good friend of mine who is trying to put on a rally in DC this September. Some donors didn’t fall through, and they are falling short on funds for sound, stage, etc.